Repetitive stress injuries like carpal tunnel syndrome, neck stiffness and chronic back pain are becoming very common these days, especially among people who work on computers. 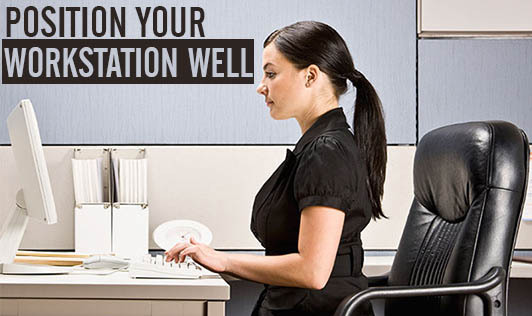 Hence make sure you take steps to properly position your workstation. Top of the screen should be at or below eye level so you can read it without bending your head or neck down or back. Monitor position should be directly in front of you so you don't have to twist your head or neck. Monitor distance should allow you to read the screen without leaning your head, neck or trunk forward or backward. Glare (for example, from windows, lights) should not be reflected on your screen which can cause you to assume an awkward posture to clearly see information on your screen. Your keyboard should be placed such that your arms are parallel to your thighs. Wrists and hands should not rest on sharp or hard edges. Armrests, if used, should support both forearms while you perform computer tasks and they do not interfere with movement. Input device (mouse or trackball) should be located right next to your keyboard so it can be operated without reaching out for it. Input device should be easy to activate and the shape/size fits your hand (not too big/small). Thighs should have sufficient clearance space between the top of the thighs and your computer table/ keyboard platform (thighs should not be trapped). Frequently used items should be kept close to avoid long reaches. Knee spaces should allow a worker to feel uncrowded and allow some changes of position even with the keyboard support lowered to the correct level for use. The workstation table should be big enough to allow space not only for all computer-related necessary equipment, but also for paperwork, books, and other materials needed while working at the computer. Any deficiencies in these areas should prompt a change in your computer workstation to improve your current work setting.